Sachin Tendulkar passed 17,000 One-Day International runs but his masterful innings of 175 was not enough to pull off victory in an epic fifth match against Australia, who prevailed by three runs. Shaun Marsh hit his maiden international century as Australia carted the Indian bowlers for 350 for four and Tendulkar's knock looked to be putting India on course for a memorable win before they were bowled out for 347 in the final over. Shane Watson led the early charge with 93 in 89 deliveries, his powerful shots down the ground and square of the wicket punishing some poor bowling while Marsh took time to settle in. The pair shared 145 before Watson pulled Harbhajan Singh to Ravi Jadeja but Marsh went on to make India pay. He made 112 in as many balls, hitting eight fours and two sixes as Australia piled on the runs, helped by a poor Indian fielding display. Ricky Ponting made 45 in 45 balls, Cameron White thumped five sixes in hitting 57 in 33 deliveries and Michael Hussey was unbeaten on 31 in 22 deliveries. Praveen Kumar picked up two wickets with Harbhajan and Ashish Nehra grabbing one apiece but only Yuvraj and Harbhajan Singh were able to operate with any degree of economy, the other four bowlers used all going at more than seven runs per over. Tendulkar then hit his runs in 141 balls, striking 19 fours and four sixes but after Tendulkar fell, the wickets tumbled alarmingly, Kumar the last to fall when he was run out by an excellent throw from Nathan Hauritz. 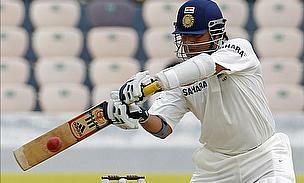 Tendulkar thrilled a capacity crowd in Hyderabad with plenty of superb shots but he was given solid support from Virender Sehwag, who made 38 in 30 balls at the very start, and then Suresh Raina, with whom he put on 137 for the sixth wicket, Raina hammering 59 in as many balls. However, the failures of Gautam Gambhir (8), Yuvraj Singh (9) and Mahendra Singh Dhoni (6) meant the pressure was heaped on Tendulkar and the lower order. Ravi Jadeja battled hard, hitting Doug Bollinger for two fours in as many balls but was unable to take over from Tendulkar when the Little Master was dismissed, looping a slower ball from McKay into the air to be caught by Hauritz. Jadeja ran himself out having hit 23 and despite a late maximum from Kumar, he had, just as in Vadodara and Mohali, been left with too much to do. The sixth match is in Guwahati on 8th November.